The media has been busy reporting the biggest single-month decline in house prices in more than five years, after RPData’s dwelling prices dropped 1.9 per cent in the month of May. With a few property pessimists suggesting prices will fall further, let’s do a quick Q&A to see what’s really going on. What do the stats actually show? 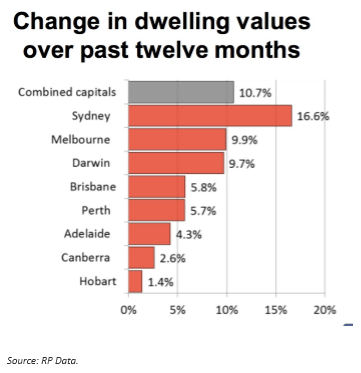 The following table shows that values were down across most capital cities with Melbourne suffering the biggest fall of 3.6 per cent. However I should explain that month to month indexes have proven somewhat volatile in the past and RPData’s house price index has seasonally dipped in each of the last 3 May’s only to pick up shortly afterwards. 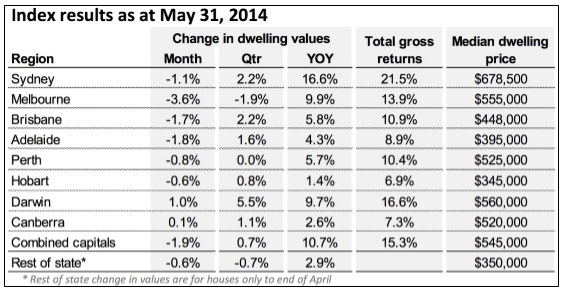 What’s behind the fall in property prices? Looking back the growth in our property markets peaked last August, and while prices were still rising till recently, they have been growing more slowly. 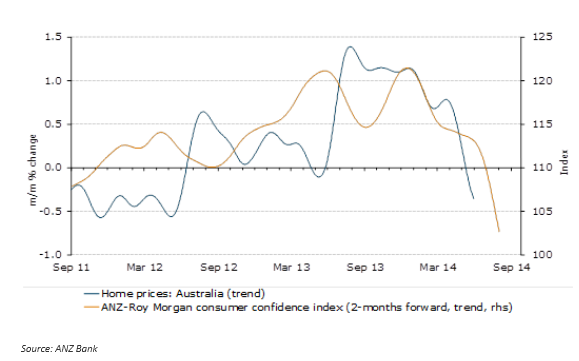 At the same time consumer confidence has been falling and since the recent unpopular Federal budget, confidence has dropped faster than when the GFC unfolded in 2008. Lower consumer confidence and concerns regarding job security leads to fewer property transactions as people put off their buying decisions, which in turn leads to lower growth or falls in property prices. One more thing: the boom in apartment developments in Melbourne has created an oversupply in some suburbs and has forced down rental yields for investors. As I forecast at the beginning of the year, house price growth in 2014 was never going to be what it was last year – with inflation less than 3 per cent per annum, house prices couldn’t sustain long-term double-digit growth. So this pause in the market is healthy. Source: RP Data. After surging for almost one and a half years price growth started slowing in the last quarter of 2013 and the fright many Australians received from the recent federal budget seems to cause many would be homebuyers and investors to pause and take stock. Digging deeper into the figures the prestige end of the market seems to be baring the brunt of the price falls, but this segment has always been more affected by business sentiment and the performance of the share market than the more affordable end of the market. What about lower auction clearance rates? Over the last few weekends the auction clearance rate has been lower than it was the same time 12 months ago, giving some pessimists further cause for concern. What they forget is that there are hundreds more properties being put to auction this year and in general the market appetite has been there with auction clearance rates only retreating back to long-term averages. Of course auction sales account for less than 20 per cent of total property sales around the country and SQM’s Asking Price Index suggests that vendor sentiment (which correlates very well with future price growth) is still reasonably strong. 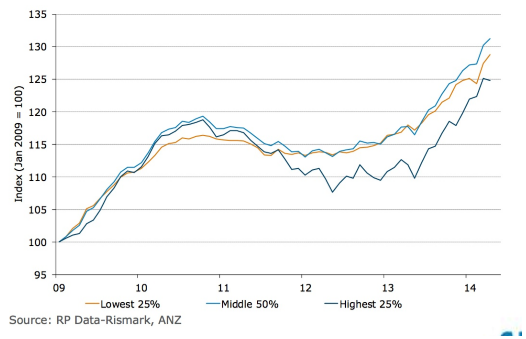 Does this mean that it’s the end of this property cycle? Despite what a few property pessimists might be saying, most analysts believe there will merely be slower property growth. What will eventually stop this cycle is interest rates rising one or two per cent and that’s a little way off because with the property markets taking a breather, it’s likely that interest rates will remain on hold a little longer. The fall in prices is likely to just be seasonal with the next month or two probably showing stabilisation in the house price series. So what does this mean if you’re looking for property? Our experience being in the property markets on a daily basis suggests there is still significant pent up demand with more buyers out there than there are good properties. However secondary properties are languishing so buyers must be very selective. Remember you’re not buying “the market” so it’s always a good time to but a good property – either your new home or an investment- at the right price. Just be realistic about your growth expectations and remember to factor in a financial buffer for the inevitable rise in interest rates. If you’re looking for independent property investment advice, no one can help you quite like the independent property investment strategists at Metropole.